Hollow cornerstone reveals jars, newspapers, and coins, so far. When the cornerstone of Baltimore's Washington Monument was laid on July 4, 1815, some 30,000 people turned out to witness the ceremony, the first such monument to honor the young country's first president. "Baltimore was proud of the role it had played in the War of 1812 and proud to build the first monument to George Washington," says Lance Humphries, restoration chair of the Mount Vernon Place Conservancy, which has been leading a $5.5 million restoration of the monument as it approaches its bicentennial this summer. 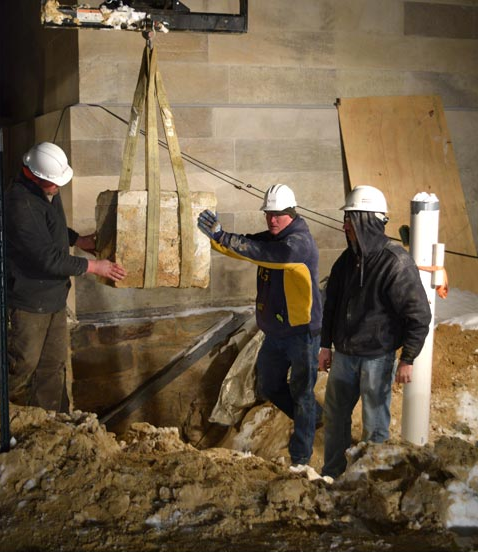 Earlier this week, workers excavating around the 180-foot monument's base discovered the 200-year-old cornerstone—a hollow, near-perfect, 2-foot cube and time capsule—the contents of which were officially revealed Wednesday. The stuff inside proved not to be much of a surprise once the cornerstone, located about six feet below grade on the monument's northeast corner, had been found. Written documents from the period of construction noted that an engraved copper plate, a sealed glass bottle containing a likeness of the first president and his second inaugural address, as well as several local newspapers and the different U.S. coins had been included. The big reveal was that most everything seems to be in pretty good shape two centuries later. A little water had worked its way into the sealed stone, but not a lot. And the glass jars appear to have effectively protected their contents. Although the likeness of Washington and the copy of his address weren't immediately visible from an initial top down glance—a number of the locally published newspapers from back in the day, including the Federal Gazette and Baltimore Daily Advertiser, the Niles Weekly Register, and the American and Commercial Daily Advertiser—can clearly be viewed. "Newspapers and coins were pretty typical of cornerstones and time capsules of the time," Humphries notes. "They were trying to show us what was going on in the world at that time." 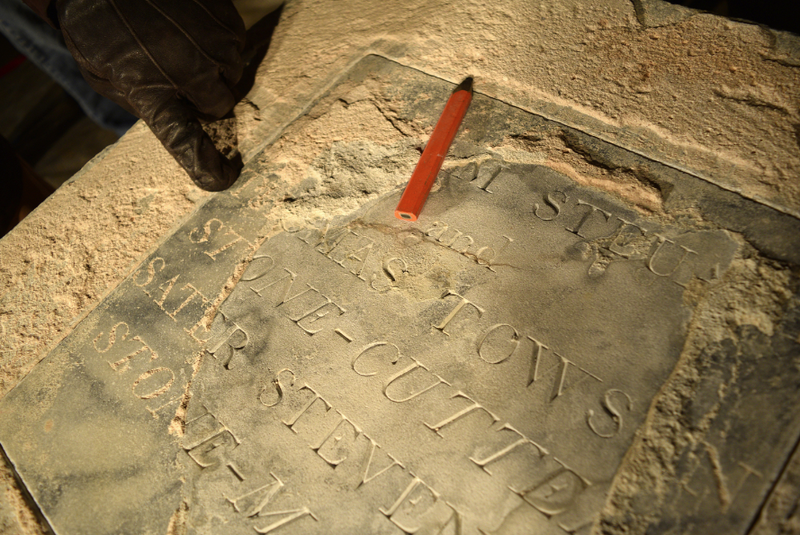 Although the engraved copper plate at the bottom of the stone appears weathered and hard to read, the stone plate covering, noting the work of stone cutters William Steuart and Thomas Towson (there's a last name Baltimore folks will recognize) and stone mason Sater Stevensen remains nicely chiseled for the most part. Preservation experts from The Walters Art Museum will figure the best way to safely remove the contents before making the next move. This is the second time capsule unearthed during the restoration process. The first was discovered in October 2014 and is dated to 1915, when Baltimoreans installed it as part of celebrations to mark the monument's centennial. That capsule currently can be seen at The Walters Art Museum and will be opened in May, at which point its contents will be exhibited at the nearby Maryland Historical Society. The hope is that the contents of the second time capsule—including the likeness of old George and the copy of his address—will also be available by then. The giant stone column with a statue of Washington at the top has been closed to the public since 2010. It's getting spiffed up for its 200th birthday celebration this July, when it will be reopened to the public followed by an old-fashioned country fair. But before all that, we've got to figure out what to put in the new time capsule planned for our future Baltimoreans to unearth. Who knows what device people will be reading the news on by then? *Baltimore senior editor Amy Mulvihill wrote about the discovery of the cornerstone Monday and contributed to this post.